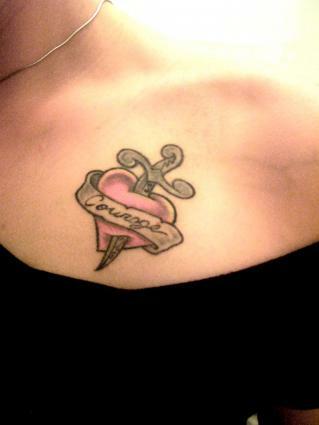 Tattoo lettering can reflect the wearer's style or add pizzazz to a picture. Lettering can come from pre-drawn flash or can be created from scratch for a unique look. The meaning of a lettered tattoo comes not just from the words, but also from the style of the script. A gorgeous pictorial tat can speak for itself. Shapes and symbols, from biker images to zodiac signs, convey the wearer's personal style. But sometimes there is more to say, and a word can be even more important than a picture. For a Celtic tattoo, the letters might be formed from intricate Celtic knots. On a tribal tattoo, bold black letters will match best. A picture of a butterfly might go with finely drawn script, while a tiger might look better with stronger lines. The "Firestarter" font which gives the illusion that the words are on fire. A tattoo doesn't have to have a picture. Initials can show your dedication to someone who's important in your life. A single word, in English or another language, can have a powerful meaning. Dates can mark transitions or life-changing events. Phrases or even sentences, done with care by a good artist, can make beautiful tattoos. The font, or letter design, is what gives lettering its style. Take a look at the different fonts on a word processing program. You'll notice that some of them have bold lines and some are finely drawn. In some, all the lines making up the letters are the same widths. In others, line widths differ. Choose a font that matches your tastes and that will work well with your tat design. Fonts without serifs (those tiny lines added to the tops and bottoms of certain letters) tend to look cleaner and more modern than fonts with them. Some styles, like Old English, add extra lines and details for decoration. Different artists have different comfort levels with lettering, so don't be disappointed if the first tattooist you approach can't do custom fonts or isn't comfortable with your ideas. Then again, if several artists warn you that a certain lettering style won't look good or won't hold up well, it's time to rethink your plan. Old English or Blackletter: This style comes from the old practice of copying texts and important documents by hand, in calligraphy. Script: Done in your handwriting, the handwriting of a loved one or the tattoo artist's hand, script tattoos are very popular. Three dimensional: A dropped shadow on one edge of the letters helps give the illusion that they are being lifted off the skin. Block letters: Block letters are one of the easiest styles of lettering for the artist to do. They also don't migrate as much over time as other styles, staying fresh and clear for the reader. You can find inspiration for your tattoo lettering styles in many different places. Most tattoo artists use stencils when working on your tats, so you can usually bring in an example of the lettering you like and have your tattoo artist set up what you want to say. If you like someone's handwriting, for example you can even ask him or her to write out your tattoo. Your tattoo artist will also have plenty of samples to choose from. Graphic design software: Graphic design programs have hundreds of different fonts to inspire you. Advertising logos: Do you have a favorite brand of motorcycle, a magazine you love or even a breakfast cereal you can't live without? Examine the lettering that appears on the logo or packaging. Do you like it? Why? Maybe it's bold, flowing or stark. What emotions does it bring up? Would a similar style work with your tattoo? Fine art: Although most art doesn't include letters, artists often have distinct styles. If you have a favorite artist, think about why you like his or her work. Could that style or color be translated to a font? Other languages: Is there a language that's written in a way you like? The flowing script of Arabic, perhaps, or the square letters of Hebrew? Bring samples of the writing to your tattoo artist. He or she may be able to help you find a font that has the same feeling. All tattoos become less distinct with time as the ink migrates below the skin. Most tattoo drawings hold up well with these small changes, but tattoo lettering, especially if it involves fine lines or small letters, can become unreadable. Letters should be well-spaced, and lines should be fine and even. A good tattoo artist will be able to tell you what to expect from your lettered tattoo. Some will set size restrictions on lettering, preferring to do only larger letters that will still look good years down the road. For tattoos with drawings as well as script, you may want to make sure that the style of the artwork and the language match. Chinese writing with a Hindu design wouldn't make a very cohesive tat, and it would be embarrassing to discover that you got the language wrong. On the other hand, tattoos are art: as long as you know what you're doing, you can combine whichever languages and styles you choose. Be careful if you choose lettering in a foreign language. If you're fluent in the language, all you need to do is make sure the flash is drawn correctly. If you're not, you'll need to find an expert in that language to verify that you've got it right. 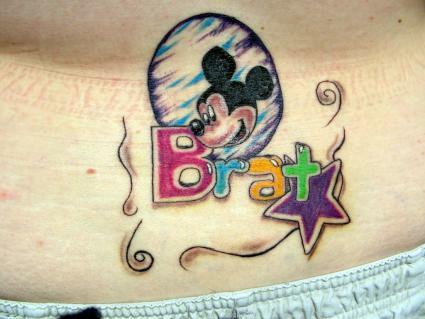 For examples of what can go wrong with foreign language tattoos, check out The Tattoo Tourist. Why Put Letters in a Tattoo? People choose to include words for many reasons. Memorials: A tat that symbolizes a lost friend or family member may be more meaningful with a name or a date. Dedications: From hearts with "Mom" banners to names of lovers, friends, or children, lettered tattoos can be symbols of love. 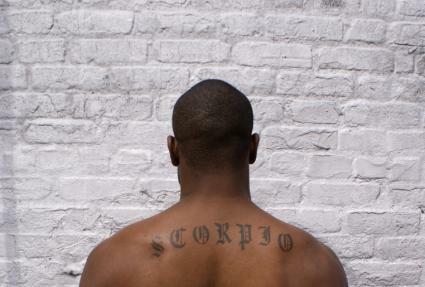 Religious tats: The numbers of a Bible verse or a word with spiritual meaning let others know of the wearer's devotion. Personal style:From T-shirt-type slogans ("Bad Girl," "Forbidden Fruit") to personal mantras, lettered tats tell the world what's on the wearer's mind. 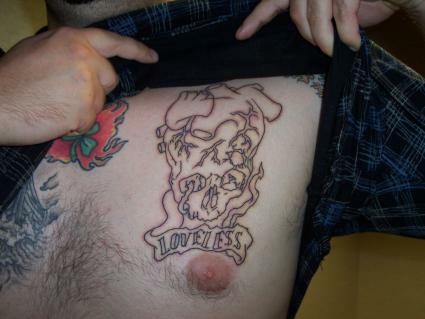 Dares and jokes: A tat can be a challenge or just make other people smile. Gang tattoos: Old English letters spelling out a name or representing a gang affiliation are a sign of belonging and a promise to remain true to the gang. Unfortunately, these types of tattoos can also be symbols of violence. Lettering can be a tattoo all on its own, or a way to add depth and dimension to another tattoo design. No matter which way direction you choose to go, make sure your script is easy to read, free of spelling errors and conveys exactly the sentiment you desire.